Italy’s most popular draw takes place three times a week on Tuesday, Thursday and Saturday and boasts some massive jackpots, with the biggest so far a remarkable £125m in 2010. It only costs £2 for a line. How does betting on SuperEnalotto at Lottoland work? Instead of entering the official SuperEnalotto lottery draw, you place a bet on the outcome and the results of it can be found here. You pick the numbers you think will be drawn in the same way as if you had entered the official lottery draw. Betting with us, you win the amount that you would have won if the official prize fund was shared between you and any official lottery winners. To bet on the Italian Lotto, select six numbers from 1-90. To win the jackpot you must match all six numbers. SuperEnalotto also includes a ‘Jolly Number’, which is similar to a bonus ball, and is used to decide the winner of the second prize tier. You will win our jackpot if your 6 main numbers are the same as that in the official SuperEnalotto draw. Can I will all the same prizes betting on the draw with Lottoland? A single line costs £2. A line with the DoubleJackpot feature costs £4. The DoubleJackpot feature allows you to bet for twice the official lottery jackpot. So, for instance, if the official SuperEnalotto Lotto draw is £35m and you bet on the outcome with us and activate the DoubleJackpot feature, you can potentially win £70m. You will pay double the price of your normal line to activate the DoubleJackpot feature. So, if you wish to bet on mini Lotto with the DoubleJackpot feature you’ll pay £4, instead of £2. The SuperEnalotto takes place in Rome every Tuesday, Thursday and Saturday at 7pm GMT. If the draw falls on an Italian public holiday, it may be rescheduled for an earlier or later date. The odds of winning the jackpot are 1 in 622,614,630. A breakdown of all the odds for each prize tier, together with estimated returns is included below. When you bet on the outcome of the SuperEnalotto, you win the amount that you would have won if the official prize fund was shared between you and any official lottery winners. The information below is provided as a guide only and your actual payout amount may differ from that below. Should you win you will be paid out in pounds. The values shown are in pound sterling. Please bear in mind that the values shown are dependent on the euro to pound exchange rate. Lottoland does replicate the payout structure of the Official underlying Lottery Draws and for this reason, from October 2017, the total prize is reduced by 12% in Tiers 1 to 3 to be in line with local Italian gambling winnings. All other prize tiers remain the same. You do not have to pay tax on your winnings, but Lottoland does replicate the payout structure of the Official underlying Lottery Draws and for this reason, from October 2017, the total prize is reduced by 12% in Tiers 1 to 3 to be in line with local Italian gambling winnings. All other prize tiers remain the same. Why should I bet on SuperEnalotto at Lottoland? 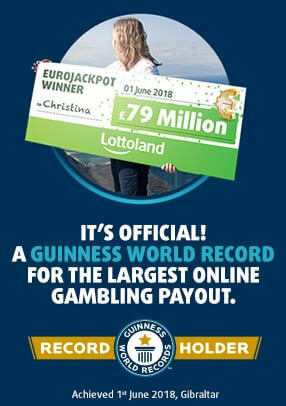 SuperEnalotto offers jackpots that are consistently bigger than those available on other European state draws. It also costs just £2 for a line and there’s plenty of chances to win, with three draws each week.